The four of us spent only one full day in Manali. We slept in a small guesthouse hidden in an apple orchard on the outskirts of the small but popular tourist getaway town. We all probably needed about a week of rest but we bought our onward bus tickets for the earliest available departure. Actually only one daily bus made the 200km trip to the remote town of Kaza. With a population of just about 4000 people it is the largest settlement in the Spiti Valley, where we planned to spend a day or so arranging special permits for onward travel. We arrived at the Manali bus station before sunrise to load our bags onto the bus and claim our reserved seats for the 6 a.m. departure. We were not surprised to find that our seats numbered 32 to 36 were in fact in the last two rows of the bus. For the first hour or so of travel, these seats proved to be better than we thought. 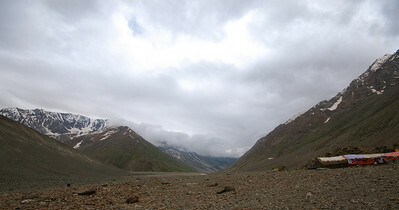 We were mesmerized by the quick transformation of the lush Manali scenery into arid plateaus and snowy passes. At the halfway mark we stopped at a restaurant whose existence was due to the necessity of feeding passengers on this particular bus ride. The bus ride was already wearing the four of us down and it was difficult to motivate ourselves to eat, despite the fresh meal ready for us on our arrival. We did however take advantage of the first bathroom break that didn't involve the driver angrily honking at any passenger attempting to lengthen the 3 minute stop. We were no longer content with our back seats and we were coming to terms with the hellish discomfort that we would have to endure for another 6 or 7 hours. The barren scenery that was just hours earlier eerily exciting was becoming depressing and repetitive. In twelve hours we would gain almost 2000m of altitude and cross two 4000m+ passes on a rickety, over-crowded bus. By the time we arrived in Kaza we were exhausted and grumpy. By the time we found hotel beds it was nightfall. Our exhaustion had made the hotel-finding process more difficulty than usual. I will take most of the blame for this as I was certainly the worst behaved that evening. I was in no mood to bargain or shop around and was willing to basically sleep anywhere. So we ended up in a empty guesthouse with characterless rooms for which we paid too much. The next morning we were awoken by Antonia at an unusually early hour. She seemed slightly concerned and came to request that we come to inspect James. Overnight he had developed a rash on his face and neck. My initial reaction was that he had psychosomatically willed it upon himself to prove to me how terrible my hotel choice was. After closely inspecting a very annoyed James we concluded that he had probably reacted to a cleaning product used on the hotel bedding. We agreed to change hotels and take it easy until his rash subsided. James and I probably visited every guesthouse in Kaza before finally agreeing on a new accommodation. By mid-afternoon James' rash had not improved, in fact he seemed to be getting sicker. His hands, feet and face had begun to swell. We decided that we wouldn't leave town until his reaction had cleared up. 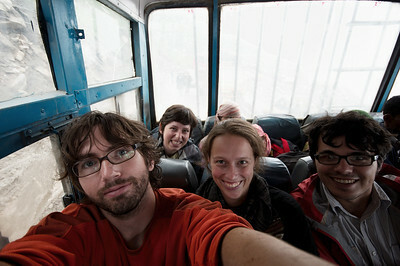 Antonia and I worked on getting our travel permits for 7 days of travel along the Hindustan-Tibet Highway. This involved frustrating back-and-forth trips between shabby government offices and the equally shabby local police station. Luckily I was accompanied by the ever-so patient Antonia, because after an entire afternoon of poor instructions and idiotic procedures she was the only one keeping me from blowing up. In fact, we secured our four permits right before another traveller's melt-down in the permit office. Another night passed with James showing now signs of improvement. James had become convinced that he was allergic to the town of Kaza and was adamant that we leave. But when it appeared that his neck and torso were swelling Yann and I tried very hard to hide our growing concern for fear of scaring him further. In the mean time we concluded that we wouldn't leave town under any circumstance as it was the only place in the valley with a helicopter landing pad and access to some form of medical care. The three of us also decided that we would have to drag the reluctant James to the hospital. We had heard a rumour that Canadian doctors were staffing the hospital, but when we arrived on a Sunday afternoon we found the building to be completely empty. We circled the empty building looking for anyone who might be able to help us. We finally crossed paths with a dentist who referred found us two off-duty nurses, neither of whom could speak English. We stood outside outside the hospital explaining James' condition. The nurses inspected him before pulling out a cellular phone and concluding that they would call "doctor"! We patiently watched and waited as one of the two nurses discussed. When she finally hung up she turned to James and exclaimed "Injection! Ready?". James almost screamed out his answer "NO!". We translated to the startled nurses: "Maybe we will come back tomorrow". They agreed that this was a reasonable plan unless James got worse in which case we should return to find them. The next 12 hours consisted of attempting to convince poor James to return to the hospital the next day. We sat in a crowded hospital waiting room the next day, and embarrassingly, enjoyed the privilege of being foreign tourists to jump near the front of the rowdy, disorganized queue of poor villagers waiting to talk to the one doctor on duty. Armed with a prescription of a hefty daily dose of anti-histamines the mysterious rash began to disappear within a day. Two days in Kaza had turned into five, but we could now continue our trip feeling that the four of us were safe to do so.